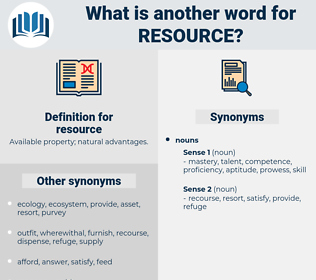 What is another word for resource? Records, practitioners, results, Societies, oceans, Publications, clerics, objections, particulars, Activities, media, positions, data, requirements, documentation. recourses, complaints, applications, sentences, calls. Miles, data, wealth, richness, documentation. using, Relying, turning, drawing, appealing, Employing, calling, going, Applying. used, Challenged, Appealed, Lodged, Brought. impotence, weakness, incompetence, debt, permanent, lack, product, poverty, inability, ignorance. This does not mean that every resource should not be developed to its full degree, but it means that none of them should be wasted. I only gather from what you say yourself that she is - fertile in resource. regress, rock cress, rush grass, rock hyrax, rice grass, rock rose, recharge, ryegrass, ricrac, racecourse, regorge, resurge, recherche, recourse, rush rose, rickrack, rye grass, rockers, rush-grass, rockrose, rigorous, ricegrass, rogers, rockcress, research, race horse, racehorse. 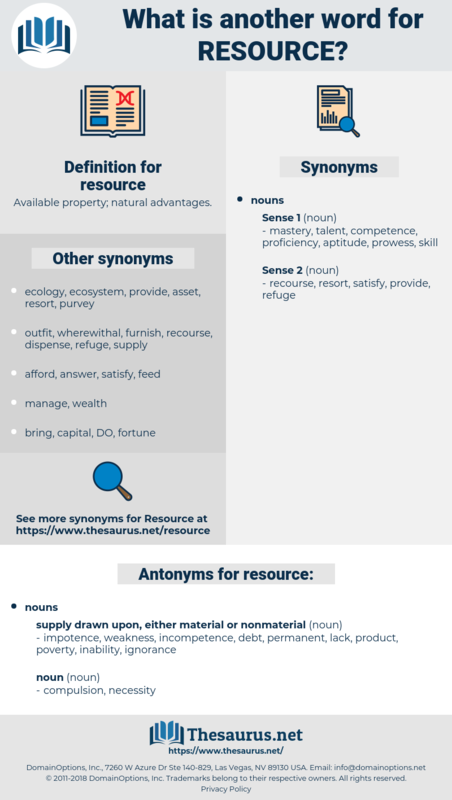 resort, recourse, inner resource, refuge, resourcefulness, assistance, aid, help. backing, sustenance, funding, financial support, living, livelihood, bread and butter, keep, natural resources, ways and means, support, natural resource, financial backing, labor resources.